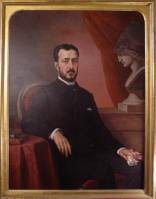 Venceslau de Sousa Pereira de Lima, the son of José Joaquim Pereira de Lima, a capitalist and a commander, was born in Porto on the 15th November 1858. After his secondary education abroad, he enrolled in the Faculty of Philosophy of the University of Coimbra, where he graduated with the dissertation "Lithology: natural coal. Monograph of the carbonide family. Part I – Coal statistics" (Porto, 1882) and got his PhD ("Natural Philosophy Theses, which under the presidency of his Honourable Excellency Doctor António dos Sanctos Viegas he proposes to defend at the University of Coimbra on the 26th November 1882 in order to obtain his PhD", Coimbra, 1882). Afterwards, Venceslau de Lima competed for the place of substitute professor in Polytechnic Academy of Porto, presenting the dissertation: "Chlorophyllin Function. Presentation and criticism of its theories." (1882) and was appointed the professor of the 7th subject – Zoology, Mineralogy and Veterinarian Geology in the Academy (1883). In 1885, after his proposition to reform the Polytechnic Academy was approved by the Parliament, he began teaching the 9th subject – Mineralogy, Palaeontology, Geology. When he was absent from the Polytechnic Academy, the subject of Mineralogy, Paleontology and Geology was taught by his colleague Amândio Gonçalves. In 1886, he was commissioned to study the Portuguese fossil flora and from then on he integrated the Geological Works Section of the Ministry of Public Works as the 2nd class junior engineer. In 1908, he took charge as President of the Geological Services Committee accumulating, in 1910, with the position of Chief Engineer of the 2nd class of the Mines’ Board. To improve his education he took an internship at the Mines ParisTech, École de Mines de Paris. Venceslau de Lima was perhaps the greatest master of Geology in Porto Polytechnic Academy, an expert on Paleobotany but mainly on Carboniferous and Portuguese Permian and largely responsible for the emancipation of the subjects of Mineralogy, Palaeontology and Geology. This illustrious professor and scientist also established himself as a man of culture and public action. He was an acclaimed speaker, an interventive politician and a curious wine grower. He cooperated in the "Portuguese Encyclopaedia" and owned a vast library filled with timeless literary works. Venceslau de Lima was a member of Parliament in several governments and constituencies (between 1882 and 1897), member of the Superior Council of Public Education (1884), Minister of Foreign Affairs (1903-04, 1906, 1908), President of the Council of Ministers (1909) together with Minister of the Realm, and Mayor of Porto (1896-98 and 1900), Civil Governor of the districts of Vila Real (1884-1885), Coimbra (1891-1892) and Porto (1901-1903), Peer of the Realm (1894) and Life Peerage in the House of Peers (1901) and member of the the Royal Council (1909). In the House of Representatives, he advocated the importance of professional education for industrial development (10th February 1883) and submitted a draft bill (18th April 1883) concerning the reform of the subject of Mineralogy, Geology, Metallurgy and Art of Mines in Porto Polytechnic Academy, adopted as law. He occupied the positions of director of the Medical-Surgical School of Porto and of the Agricultural and Commercial Company of Port Wines, S.A.R.L. (1887-1909), President of the Northern Anti-Phylloxera Committee, Ombudsman of Santa Casa da Misericórdia do Porto and Vice-president of the Executive Committee for the National Assistance to Tuberculosis. He was part of the Porto Patronage Committee and headed several charitable institutions. Distinguished by prestigious national and foreign institutions, he was a full member of the Lisbon Academy of Sciences and of the Coimbra Institute, a member of the French Geological Society and an honorary member of the Porto Trade Association. He was awarded the Grand Cross of the Order of the Tower and Sword, he was Commander of the Orders of S. Tiago, of Nossa Senhora da Conceição of Vila Viçosa, France’s Legion of Honour, of Charles III and Isabel the Catholic of Spain, of S. Lázaro and S. Maurício of Italy, of Victoria of England and of Leopold of Belgium. After the regicide (1908), he became one of the closest advisers of D. Manuel II. At the end of 1909, he left the government and became Council State adviser. Following the reinstatement of the Republic, he left the Polytechnic Academy of Porto and his political career, and focused instead on research, seeking to study the Portuguese carboniferous lands, a work left unfinished.